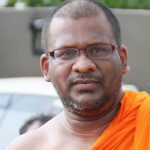 General Secretary of the Bodu Bala Sena (BBS) Galagoda Atte Gnanasara was sentenced to 19 years of rigorous imprisonment by the Appeals Court on four Contempt of Court charges over an incident that took place on January 25, 2016. The sentences will run concurrently and will be completed in 6 years. President of Court of Appeal, Justice Preethi Padman Surasena and Justice Shiran Gunaratne announced the sentence this morning (August 8). The defendant was not present in court at the time and defense counsel informed court that his client had been admitted to the Sri Jayewardenapura Hospital. The determination was on a case filed by the Attorney General against Gnanasara following a petition submitted to the Appeals Court by the Former Homagama Magistrate and current Colombo Chief Magistrate Ranga Dissanayake. Earlier Gnanasara was sentenced to 6 months of rigorous imprisonment on June 14 for threatening Sandya Ekneligoda, the wife of missing journalist Prageeth Eknaligoda within the Homagama court premises. Former Homagama Magistrate and present Colombo Chief Magistrate Ranga Dissanayake, Deputy Solicitor General Dileep Peiris and prison officers filed statements against Gnanasara Thero. According to spokespersons of the BBS, the determination has already been challenged in court. This man is an insult to Buddhists and Buddhism. Constitution – consistent with the Lincolnian phraseology.